A perennial shrub native to Europe and the temperate parts of Asia, comfrey has been traditionally used to help heal bone fractures, tendon damage, and more. Today, comfrey is a popular source of allantoin, a natural compound known for its moisturizing and softening abilities. Comfrey is a natural source of “allantoin,” which is popular for moisturizing skin. 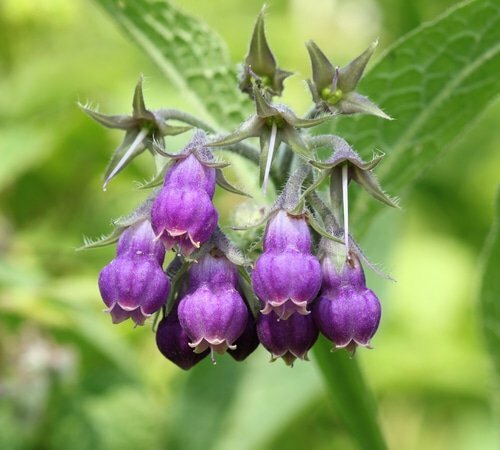 Scientifically called Symphytum officinale L., comfrey is also known by the names “knitbone,” “slippery root,” “bruisewort,” and “blackwort.” It grows to about 2-3 feet high, with thick, hairy stems and flowers arranged in clusters of purple, blue or white. It likes to grow in damp, grassy places, and has large lower leaves up to 10 inches long that decrease in size the higher they are up the stem. Comfrey typically blooms throughout the greater part of the summer, with the first flowers opening in late April or early May. Before opening, as you can see from the picture, the blooms are bell-shaped. The root, which can also be used in skin care and for other health benefits, has a black outside and a fleshy, whitish interior. Comfrey was traditionally used to soothe upset stomach and intestinal problems like diarrhea and dysentery. According to the University of Maryland Medical Center, however, the plant contains potentially dangerous substances called “pyrrolizidine alkaloids” that are toxic to the liver and can cause death. The Food and Drug Administration (FDA) no longer allows any oral comfrey products to be sold in the U.S. Other countries have made similar restrictions. Though comfrey is not recommended for internal use, its topical uses abound. This is mostly because of the compound allantoin, which is also why comfrey is such a key ingredient in skin care products. Researchers have found that allantoin has soothing, firming and tightening properties. Comfrey's high content of allantoin is really it's claim to fame. It can help reduce the appearance of fine line and wrinkles and many find it to be effective for oily skin. Comfrey is also great for sensitive skin. A mild cleansing property makes comfrey cream a good solution for removing dirt, oils and impurities without agitating. We have comfrey in several of our products. Though other manufacturers may have synthetic (man-made) allantoin, ours comes only from the roots and leaves of the actual plant. Do you have other tips on how to use comfrey? Please share. i hear allantoin is water soluble, then why do you add in face oi? how does that help? You’re right, allantoin is water soluble. However the regeneration and softening effects of comfrey in oils is well documented by scientists and herbalists alike!